Spotify finally released an update to their Android app this week and boy did they come up with something special! Released as a “preview” version (so it’s not yet available in the Google Play store), this beta app is a complete rewrite that brings a host of features to Spotify on Android for the first time. 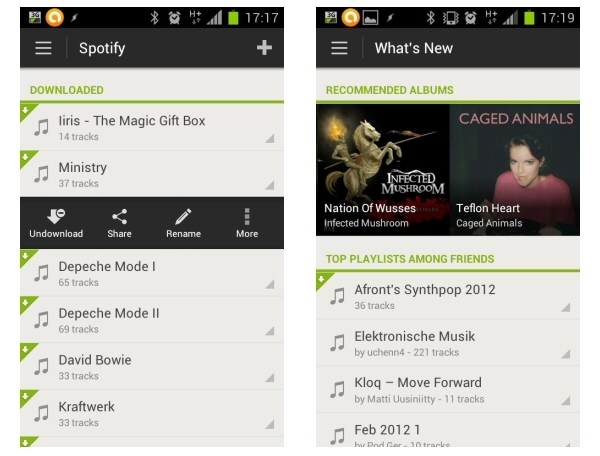 It’s also fully compatible with Ice Cream Sandwich, making this the first Spotify tablet app. The web is full of press release rewrites and brief overviews of the new app, but here is an in-depth expert look at what’s new, what to expect in the final version, and some hints and tips for “power users” to get the most out of the preview app. The first thing you’ll notice when starting the new Spotify on Android is how much faster and smoother it is compared with the previous version. Google’s Holo theme is used throughout, lending the app a polished 2012 feel that has seen the end to any lag when navigating around the app. In keeping with ICS, the greys have been darkened down and the subtle use of Spotify Green throughout adds suitable brand identifiers. The old tabs at the bottom are gone: instead there’s now a smooth slide out sidebar with options for Search, Playlists, What’s New, Inbox, Friends and Settings. 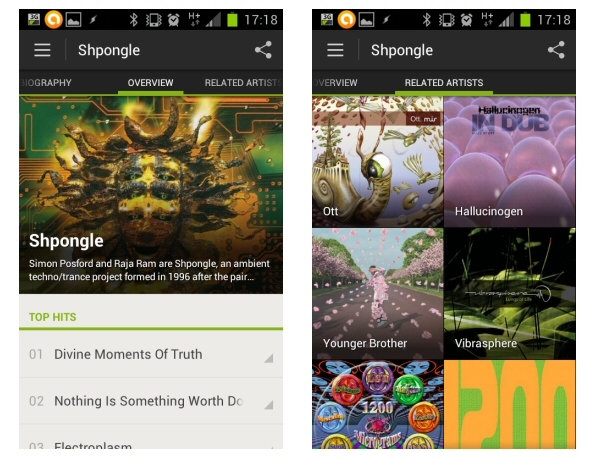 Links to the main pages have been moved to the side; the turbo-boosted search now shows artist and album art. The Search function shows a vast improvement: it’s way WAY faster than before and results are all listed on the same page. 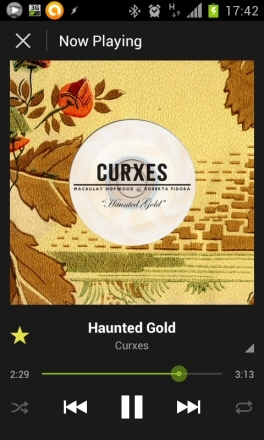 It also now shows artist and album art for the first time on Android: just like the iPhone version! Clicking through to an artist goes to an Overview page showing a large artist image following be sections for Top Hits, Albums, Singles, Compilations and “Appears On.” Sliding the page to the left shows the artist Biography page and on the right is a new Related Artists page. This has a collage of images for the top 20 most-related artists and is an excellent addition for music discovery on mobile. Artist pages now have large, hi-res artwork; the all-new Related Artists tab is much like the desktop but debuts on mobile with this preview release. The player itself has also had a huge makeover. In full mode it shows off the new high-resolution album art to the max, with all the playback buttons you’d expect below and a standard ICS-style triangle button to popup a menu with further options such as Add To Playlist and Share. Hitting the “X” top-left shrinks down the player to the bottom of the screen, where you can still access the play/stop button while navigating the rest of the post. Most importantly though, two new core playback features have arrived with this preview release. Firstly there’s the option to both stream and download in Extreme Quality. Extreme Quality is roughly 320 kbps (it’s Ogg Vorbis q9) and pretty much the entire Spotify catalog is available in this high audio quality format. If you’re an audiophile this bitrate should be your standard setting: everything I’ve listened to so far sounds crisper and so much sharper than before. The new player looks fantastic, I just wish it mentioned the name of the album somewhere. The second new playback feature (unannounced in the press release but discovered by yours-truly!) is gapless playback. Gapless playback came to the desktop recently and now it makes its debut on mobile with this Android preview. I discovered the lack of gaps while listening to a Shpongle album to check out the Extreme Quality setting (Twisted Records albums are always expertly produced). To my delight, I discovered that each track sequences perfectly into the next, just how the artist intended. I hadn’t “downloaded” the album and was streaming it live. And this was even on a 3G connection, not wi-fi! Another area that sees a big overhaul is, perhaps unsurprisingly, the social “My Friends” side of things. The Friends page lists all your buddies and you can now click through to view their profile pages. This reveals your friend’s Top Tracks, Artists and published playlists. When sharing a track or playlist to a friend you can now add a comment (as on iPhone) and from your Inbox you can now see received comments too. This all makes the Android app feel a lot more social and connected, encouraging you to spend some time checking out what your friends are listening to. I’d like to see a split between “everyone” and “favorites” as on the desktop though, as many of my Facebook friends have, ah, very alternative tastes than I. 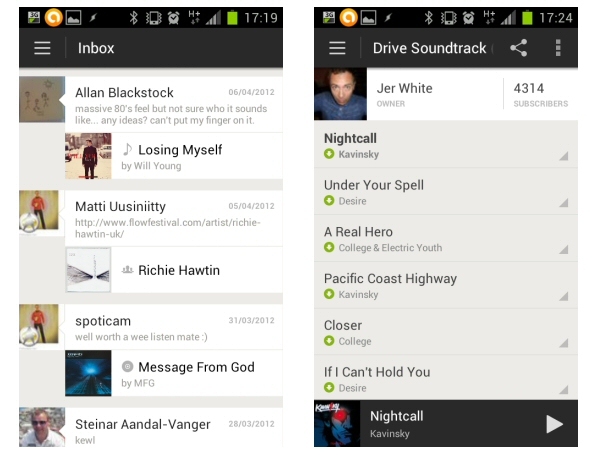 The Inbox now shows album art as well as any messages; viewing a playlist now also shows the number of subscribers. Other welcome tweaks and new additions include the ability to rename a playlist (yes, that’s only just arrived on Android! ), release dates are shown for albums, and I especially like how I can now see how many people are subscribed to my playlists. There are of course a few things missing from this preview release that the old version had: scrobbling to Last.fm for one, as well as a homescreen widget and the ability to set the storage location (but see below for a workaround tip). 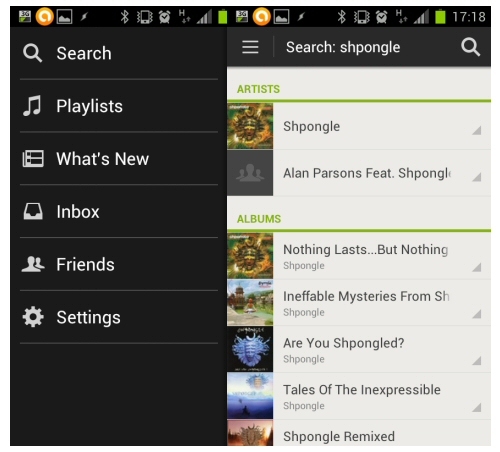 Spotify have promised scrobbling will make it into the final version along with – finally! – playlist folders. There also seems to be no way to playback local files any more (the Library page has gone) unless you add them to a playlist from your PC then set them to download on your phone/tablet. And while you can add a track to the play queue, there’s no way to view or navigate the queue. Oh, and there’s no Landscape mode yet either. A few tweaks I’d like to see: the main playback display doesn’t show the album name (you need to press the triangle button then Album to view album details) so I’d suggest using the space currently taken up by the Now Playing text to display the album/artist/track name to display all three. Another tweak I’d like is a better way to distinguish Downloaded vs. All playlists. Currently, all downloaded playlists are listed twice (once in each section) which, if you tend to download everything for later playback like me, then your list of playlists is double the length it needs to be (with the added confusion of new playlists being created right in the middle of the two sections). Hopefully though the promised inclusion of folder support in the final version will remedy this. Playlists are divided (and duplicated) into Downloaded and All sections; the What's New page is now much more like its desktop counterpart. Although this release is technically a preview version, I unreservedly recommend anyone using Spotify on their Android device to switch over now. This preview is far more stable than the current regular version, and if you want high-bitate, gapless playback then you can have that right now. I’ve spent the past few months moaning about the state of Spotify’s Android app – it hadn’t seen much of an update for a whole year and was starting to get decidedly flaky – but this new rewrite has turned everything around. It’s fast, it’s slick, it fits in perfectly with the Ice Cream Sandwich look-and-feel and it brings some new killer features to Android mobile music. POWER-USER TIP #1: To set the storage location, first set it using the regular (non-preview) version of the app (to do this, select the option from the Menu when at the login screen). Then install the new preview WITHOUT removing the previous version. The preview replaces the old version but retains its setting for where to cache files. So if you set this to an external SD card, it will continue to use that location. POWER-USER TIP #2: To enable lock screen player controls, go to Settings > Applications > Spotify then click Clear Data. This may not work for every device, but it has been reported to enable the lock screen controls for the HTC One X, Galaxy Nexus and Galaxy S.